Immune system brakes, optical tweezers, and enzyme evolution. Three separate subjects that span this year’s Nobel Prizes in Physiology or Medicine, Physics and Chemistry. Despite the differences in theory, however, the diverse discoveries have one thing in common: they have applications in the biotechnology industry, Labiotech’s favorite subject. For their work on molecular ‘braking’ mechanisms in the immune system, the Prize in Physiology or Medicine went to joint winners James Allison, University of Texas, and Tasuku Honjo, Kyoto University. Cancer cells are sometimes able to evade the immune system ‘ninja-style’ by manipulating molecules on the surface of immune cells called checkpoints. Cancer cells particularly activate inhibitory checkpoints, which put ‘brakes’ on the immune cell function, allowing the cancer to continue multiplying unchecked. Back in the 1990s, Allison and Honjo studied inhibitory checkpoints and their efforts led to the approval of cancer drugs that release the checkpoint brakes such as Yervoy, developed by Medarex and BMS, Opdivo, from Merck, and Keytruda, from BMS. These therapies have some limitations, however, pharma companies are still interested in the field. In 2017, 1,500 clinical trials were testing checkpoint inhibitors, mostly in combination therapies with other treatments. For their roles in developing laser-based techniques, half of the Prize in Physics went to Arthur Ashkin, from Bell Laboratories in New Jersey, and the other half was split between Gérard Mourou, from the École Polytechnique and the University of Michigan, and Donna Strickland from the Canadian University of Waterloo. Ashkin developed a technique that sounds like the ‘tractor beam’ from Star Trek, which could push and pull objects using just a continuous beam of light. With these ‘optical tweezers’, he could move bacteria just by shining a laser at them in the lab. Many labs now use the technique to shine beams of light inside cells and precisely manipulate molecules within, such as motor proteins, studying how they work. Furthermore, optical tweezers are becoming useful in synthetic biology, because they can move cell components in the lab without the risk of cross-contamination. In contrast to Ashkin’s continuous beams, Mourou and Strickland worked with short laser pulses, which are useful for precision work. They found a way to increase the intensity of short laser pulses without destroying the equipment, which revolutionized the field. This led to the development of laser eye surgery, and also paved the way for improving industries such as electronics and the manufacture of medical devices such as cardiac stents. One half of this year’s Prize in Chemistry was awarded to Frances Arnold, from the California Institute of Technology, USA, for her work in evolving enzymes for use in the chemical and pharmaceutical industry. The other half was shared between George Smith, from the University of Missouri, USA and Gregory Winter, from the MRC Laboratory of Molecular Biology, UK, for developing phage display, a technology that would let researchers evolve novel antibodies for the clinic. In the early 1990s, on a mission to investigate new and better forms of enzymes, proteins crucial for manufacturing organic chemicals in the lab, Arnold decided to let nature’s powerful tool, evolution, do her work for her. By introducing random mutations into bacterial enzymes and placing the bacteria into challenging conditions such as a solution of polar organic solvents, Arnold could reap the most suitable enzymes in that environment. This had particular applications in pharmaceutical manufacture, renewable energy, and biofuels. Phage display is a technique invented by Smith in 1985, to isolate and identify the genes encoding known human proteins. He inserted unknown human DNA into viruses that infect bacteria. Inside the bacteria, they multiplied, expressing proteins from that human DNA on their surface. He could then use antibodies against the target protein to attach to the phages with that DNA, and then sequence it. Winter started developing this phage display technique to evolve new clinical antibodies, and has launched multiple successful biotechs designing them for therapeutic uses, such as for treating inflammatory disease and cancer and targeting bacterial toxins. 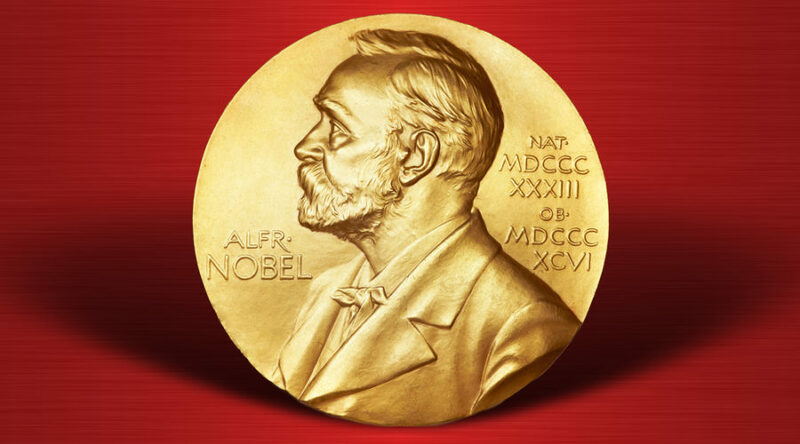 The diverse nature of the research behind the Nobel Prizes this year demonstrates that it is always hard to predict how new advances in physics, chemistry and biology might affect the biotech industry in the future. While they have been criticized in the past, the Nobels do help spotlight which discoveries have had the most impact in recent years, making them useful tools for guessing which technological blockbuster might come next. It is now time to start guessing which discoveries will appear in the awards next year!